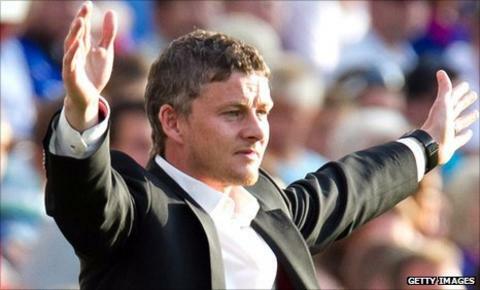 Former Manchester United striker Ole Gunnar Solskjaer has led Norwegian side Molde to their first league title in his first season as a manager. The 38-year-old took over at his former club in November after a spell as reserve team coach at Old Trafford. Molde finished 11th in their domestic top flight last season but they are eight points clear with two matches remaining this term. Molde secured the title with a 2-2 draw against Stromsgodset on Sunday. Rivals Rosenborg, the only side who could have closed the gap, lost 6-3 to Brann Bergen. "The club has waited 100 years for this," Solskjaer told Norwegian newspaper VG. "We have been close several times so this was well deserved. "When Brann went 4-1, I realised we had done it. It was a good atmosphere in the dressing room and we will enjoy ourselves tonight." Molde's first title was secured with help from two other former United coaches, Mark Dempsey and Richard Hartis, who Solskjaer brought into his backroom staff upon being appointed. Current United defender Rio Ferdinand paid tribute to Solskjaer's managerial success on Twitter, describing him as "a true gent in the game". Solskjaer left Molde as a player in 1996 in a £1.5m deal. The Norwegian scored 126 goals in 366 games for the Red Devils, including a dramatic winner in their 1999 Champions League final win over Bayern Munich. In addition to that European Cup triumph, the forward lifted six league titles and two FA Cups during his time in England.